Award-winning filmmaker, Martyn Colbeck, has filmed wildlife for over 20 years, capturing our planet’s most incredible species with his lens. 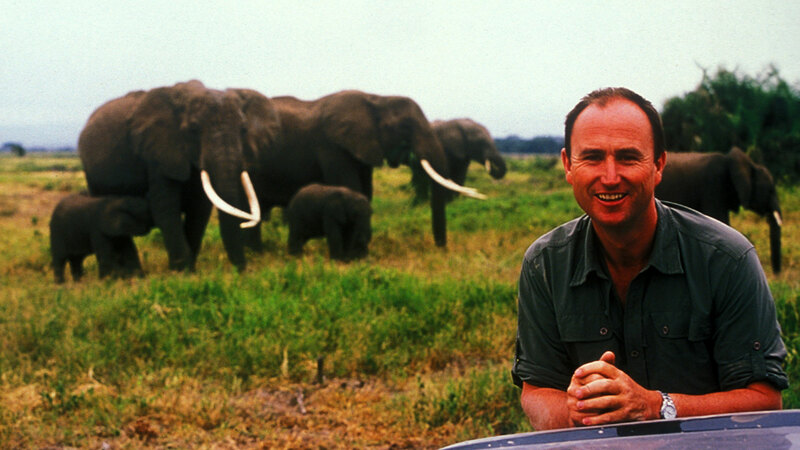 But it was Echo and her family of elephants that inspired Martyn to devote, not one, but three films to them. NATURE had the opportunity to find out how exactly this family captured his heart. What were your first impressions among the elephants? It was an amazing moment as I had never seen an African elephant before. In 1989, I went to Amboseli for the first time to film a segment for David Attenborough’s Trials of Life. The producer I was working with for that segment had known Cynthia Moss for some time and she had always wanted to go out with Cynthia to see her elephants. So Cynthia took us out in the car into the park. In the middle of this herd of elephants, she stopped her car, turned off the engine and she just started to talk about this family of elephants. This was not Echo’s family by the way. But Cynthia just started describing each of these elephants. She knew each one. She just started talking to us about them as individuals. It was almost as if we were at a party and she was describing everyone to us. What was most amazing was that we were in the middle of Amboseli National Park. We were surrounded by Kilimanjaro. It was a stunning environment. But the individual personalities of the elephants were what stood out. It was quite a revelation to me. The producer’s idea was to do a film like an elephant soap opera. It would be a long-term project and was actually based on the documentary Seven up! The idea was that because elephants are so long-lived, we could follow them as the years passed. Of course the next step was deciding who to follow. That was up to Cynthia. She was studying 53 elephant families in Amboseli. But Echo’s family came up at the top of the list, mainly because Echo was the first elephant who had been darted and radio collared back in 1972. So she was one of the first elephants studied. Also, Echo and her family were relatively predictable. And she was quite a homebody, which was a good thing. We didn’t want a family who would constantly be on the move and disappear on us through the filming. We couldn’t follow along with their life events if we lost them. How crucial did it turn out that Cynthia had chosen Echo? Echo is a remarkable elephant. She was an extremely good choice. She was around on a regular basis virtually every day. In order for the film to work, you just can’t go off and film a replacement family. Echo’s story is the main thread of the series. But she was also a good choice because, over the years, the most extraordinary things happened to her and her family. For instance, in 1990, I had started to film in January and very little was happening with Echo’s family. But by February, the most incredible thing happened to Echo. She gave birth to a crippled calf. It was truly an extraordinary, very rare event. And this was the only time such a birth had been documented. And then we were able to film the most incredible events after that. We filmed them sleeping. We filmed the kidnapping. What was Echo and her family’s perception of you? It’s hard to know. I think there may have been an element of knowing that if we were around, there was a safety aspect. I think they accepted us as part of the family. Elephants have this extraordinary and complicated greeting display — they use this to greet each other when they’ve been apart. And occasionally, Echo actually greeted our car when we arrived. She would make a terrific greeting with the car. We spent so much time with her in that car; she must have recognized the style of the car. Why are there misconceptions of elephants being raging creatures? I think there is a misconception about elephants. And the incidents of elephant rage come from elephants in a disturbed population or in conflict with people. I’ve found that if you give them the benefit of the doubt, they are not generally an aggressive species. They are naturally gentle and trusting. When you betray that trust, they get aggressive. I’ve seen that with tourists. They drive fast. They rev up their engines. They act inappropriately. Some of this is to get a reaction from the elephants. And basically it just irritates the animals. Elephants are not aggressive animals. They have been made to be aggressive. Even if they are irritated with you, they will give you some warning. They are not like rhinos who just charge without warning and flatten you. If they do, there’s a historical reason — or a serious threat. Do you think elephants can recognize people and understand their intentions? I think they identify individuals. It is so hard to quantify though. Some scientists might be cynical. They would say you need real data. If you spend a lot of time with a particular animal — like I do with elephants — you will get a sense of what they’re thinking. There is a level of understanding with spending so much time with animals. One of the things with filming elephants is you have to be able to anticipate behavior. You have to understand what they’re going to do. Not just acting on instinct. They are actually making a decision. I’ve seen instances of elephants having a discussion and clearly two elephants are disagreeing. And then one makes a decision and the other follows that. It is very interesting to watch. In order to know that, you have to know the individual. You have to have spent a lot of time with them. How long are you out there shooting to document the life of an elephant family? Each of the three Echo films took eight months to shoot. During those eight months, I would be out from dawn to dusk every day. Ideally one would film longer but budgets and other restrictions limit you. But of course, the longer amount of time you spend out there, the more likely you will capture unique events because we are actually distilling small bits of their behavior. What was it like to be a character in this film? It gave me the opportunity to tell people how I felt about elephants. Usually when you make a film, you have a narrator who is not involved in the film telling the story to the audience. But with this film, I had the chance to tell the story. It was quite nice to tell audiences that I’ve been with these elephants for 20 years. I’ve spent a lot of time with them. I know these animals. And this is how I feel about them. Of course it is slightly unnerving to put yourself on the line. But I had the benefit of expressing sentiments that scientists can’t. Will there be another Echo film? It’s an ongoing story. I don’t feel like I’ve completed the filming because these animals are so complex. I still look forward to spending time with them. We’re learning more about them all the time. They communicate on such complex levels, and we’re only scratching the surface. We’re sure to discover so much more. The more people understand about elephants, the more people understand how much they’re worth conserving. Are elephants your favorite animals? No doubt. They would have to be. I’ve done a lot of filming of primates as well. But elephants continue to surprise me. There is just so much more to learn.